Sail across the Atlantic Ocean in one of these exciting voyages, including the ARC Rally. All three are ideal for sailors of every level including individuals, couples, thrill seekers, people with time on their hands, people that fancy an adventure. The skippers we use for these trips are very experienced, highly qualified sailors and you'll join a crew of 12 on a 48 ton, 72ft Challenger yacht, built to sail around the world. 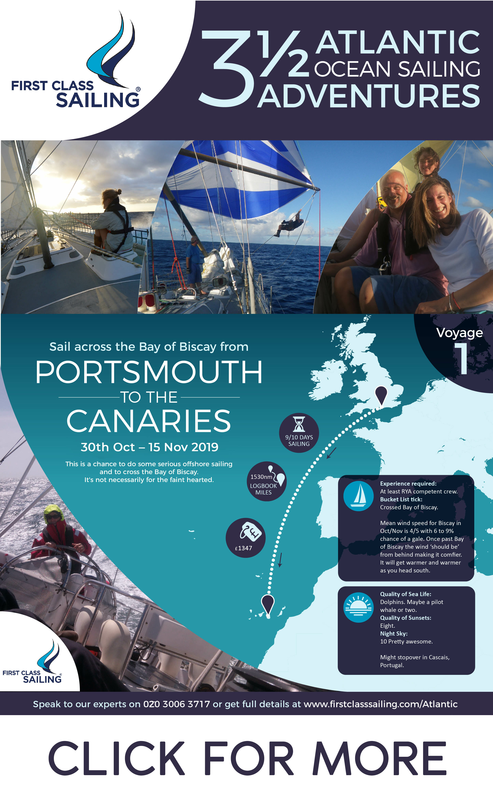 The first voyage of our Atlantic Ocean adventures will take a Challenger 72 yacht from Gunwharf Quays in Portsmouth to Gran Canaria in the Canaries across the famous Bay of Biscay. The 2019 Atlantic Rally for Cruisers is the second voyage of our grand adventure package; it is also the most popular choice. The third and longest voyage of our Atlantic adventures is probably the best value you can buy. Itinerary: Jolly Harbour, Antigua - Gunwharf Quays, Portsmouth. Possible stopover in Horta in the Azores. If you have any questions about these adventures, or queries about flights and hotel booking, please use the form below or call the office on 023 8001 1077 and we'll get back to you within one business day, if not sooner!